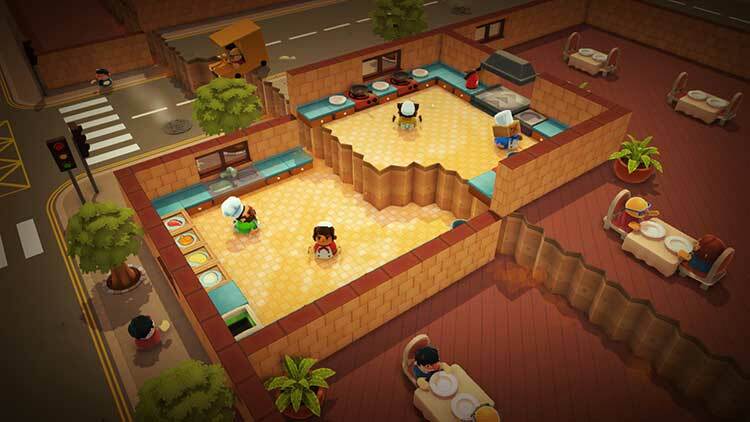 Overcooked is a co-op cooking game for 1-4 players. Working as a team, you and your fellow chefs must prepare, cook and serve up a variety of tasty orders before the baying customers storm out. Take part in an epic journey across the Onion Kingdom and tackle an increasingly challenging and bizarre gauntlet of kitchens which will push your skills of co-operation and co-ordination to the very limits. Aside from from the local-only consideration and some inconsistencies with the scoring criteria and stage layouts, man, what a game. Overcooked is the best co-op experience I've had in recent memory, and despite going back through to fully clear every level, I wish there were more. Don't overlook it. Overcooked contains all the necessary ingredients for a truly excellent co-op game. Stress is always balanced out by feelings of accomplishment and progression, and its gameplay requires a mix of smart planning, consistent communication, and some level of dexterity to execute plans effectively. 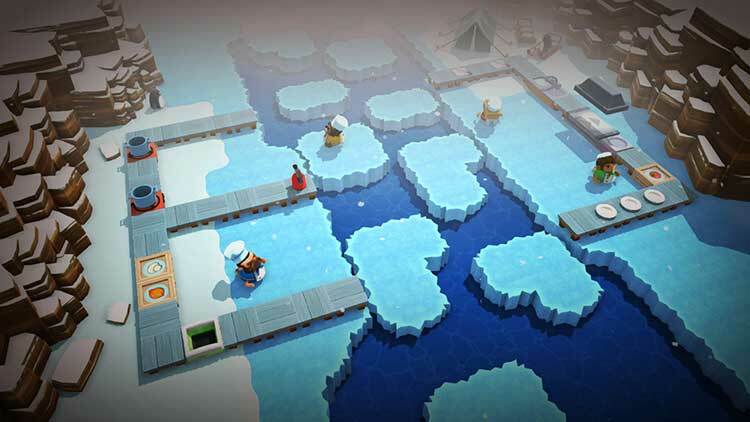 Overcooked nails local co-op multiplayer gaming perfectly. It's incredibly easy to pick up and play, yet coordinating its myriad of seemingly-mundane tasks requires its players to constantly communicate. 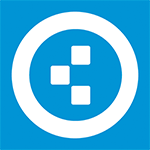 What transpires is riotous and often hilarious gameplay that's simply great fun to play. Unfortunately, it's not quite as entertaining as a single-player experience, but if you have friends and family to play with, Overcooked is highly recommended. If it were multiplayer-only, it actually might have fared better, but the sloppy single-player design cannot go ignored. And even without that, a flawed campaign hinders an otherwise good-looking game with some nice gameplay at its core. If you have the patience, you may want to at least give it a taste, but otherwise, send Overcooked back to the kitchen for being underdone. 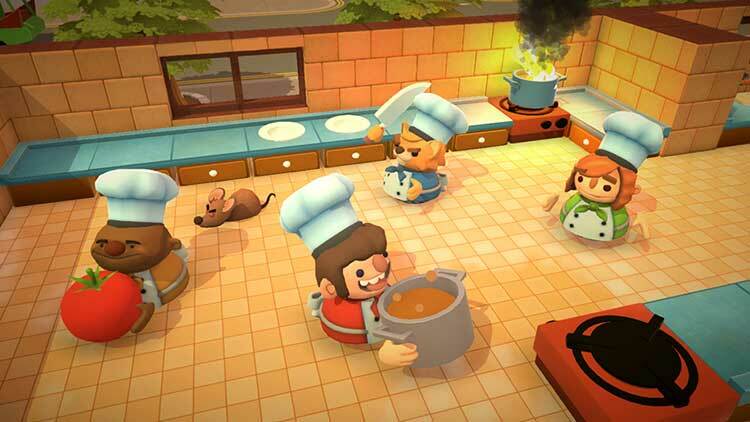 With simple controls and an easy to understand premise, anyone can turn their hand to it with ease, then partake in some truly stressful yet fun multiplayer cooking action. Crafting a game that feels like a true co-operative experience is something studios continue to struggle with even today. For a dev duo like Ghost Town Games to come along and nail it at their first attempt is a remarkable feat to say the least. As a result, Overcooked is easily the best co-op game of 2016 so far and will hopefully set living rooms afire with its accessible, often hilarious culinary hijinks. Like all the best party games, its strength lies in its simplicity, its clever design, and the fact that it's just so much darn fun to play. 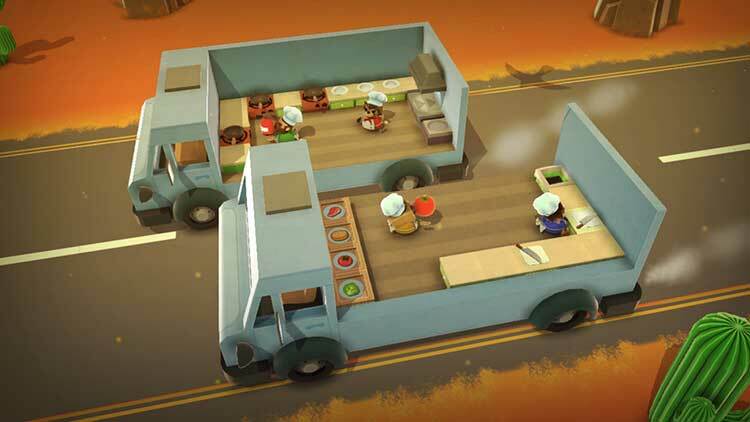 Overcooked is one of those rare gems that possesses the ability to endlessly generate comedy moments and is the perfect choice for those lengthy multiplayer sessions, though probably best avoided if Gordon Ramsay is due a visit. Serving up an addictive slice of couch co-op madness, Ghost Town Games' first outing is one that truly took us by surprise. It's simple controls make it easy for anybody to pick up and play, and the action remains fresh throughout thanks to a slew of new environments and mechanics. 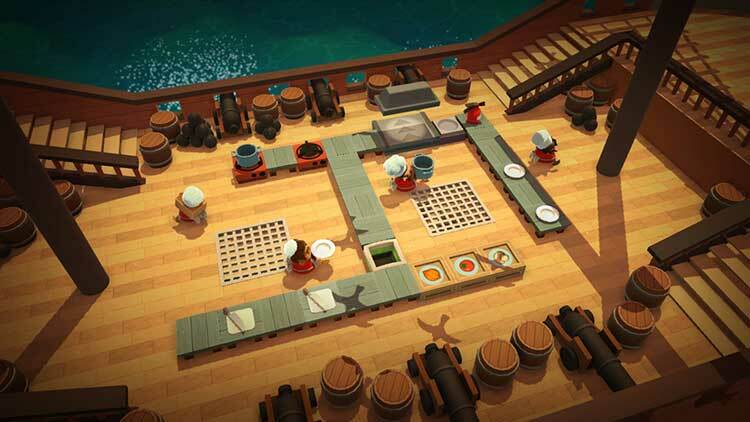 The single-player experience may pale in comparison and there is a complete absence of online modes, but this still doesn't prevent Overcooked from being a culinary feast. Aside from a few minor presentation and performance niggles, Overcooked is a wonderfully executed game, and is one of the best co-operative experiences in recent years. The simplicity of the controls and gameplay make it extremely accessible, while there is still plenty of challenge in the later, crazier kitchens. 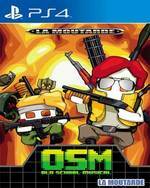 Versus mode can be fun with four players but if there are three of you it simply won’t let you play and two makes you control extra characters in the same manner as single-player. This in turn makes you notice the lack of online play even more. However, when a game is as balanced and perfect in co-op mode as this it’s hard to worry about these things too much. A thoughtfully crafted love letter to the sort of titles that many of us forged our gaming mettle with. If you're in the market for a quirky, fun indie title that'll have you hurling instructions and insults towards your friends with equal frequency, then look no further. But for those who can't handle the heat, it's best to stay out of the kitchen. La rejugabilidad arcade y el competitivo palían un poco la corta duración de su campaña -que se puede terminar en un puñado de horas-, y al contrario de lo que muchos pensarán al ver un juego tan inocente, es muy adictivo. Lástima la falta de ambición por ampliar contenido y modos, que harían de este menú mucho más redondo. Ho riso moltissimo durante la mia prova e sicuramente è uno degli obiettivi che si era prefissato il team di sviluppo. 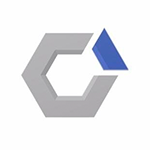 Il gameplay è senza un attimo di pausa e le situazioni comiche vengono a crearsi da sole, continuamente, soprattutto quando si cerca di stemperare la tensione causata dalla crescente difficoltà dei livelli, equilibrata e mai esagerata, sempre fonte di una sfida genuina. Ondanks dat mijn hoofd soms overkookte van chaos, heb ik erg kunnen genieten van deze game. Dit is weer eens wat anders dan het gebruikelijke schieten of racen. Overcooked slooft zich niet enorm uit, maar speelt wel gewoon verdomd lekker weg. Doordat de game vraagt om een goede coördinatie is Overcooked het leukst met een groep vrienden. Overcooked is wel te spelen in je eentje, maar komt pas echt tot zijn recht wanneer je het met een groep vrienden speelt op de bank. Overcooked biedt een heerlijke balans aan chaos, coördinatie en gekkigheid en alles vraagt ook nog eens om een bepaalde mate van skill. Efter ett par sittningar med goda vänner måste jag medge, det har är det bästa ”couch co-op”-spelet jag spelat den här generationen. Så vad gör det att Overcooked inte är kul när du spelar själv? Det är inte ett spel du ska spela ensam. Jag väljer att ta det som ett statement från Team17: Skippa online ibland! Träffas, umgås, gapa och knuffas. Som ni gjorde förr. Och som ni förhoppningsvis kommer att göra många långa kvällar framöver.